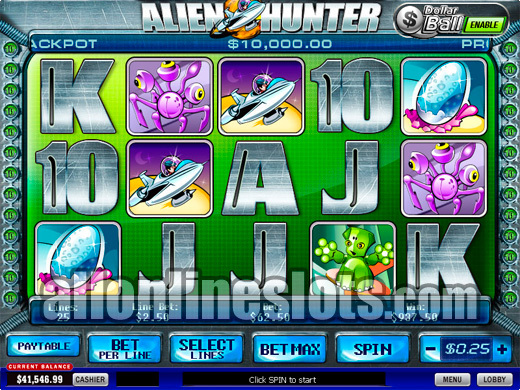 Alien Hunter is a Playtech video slot with two bonus features. Top jackpot is 10,000 coins per coin bet per line and coin sizes start at one cent. 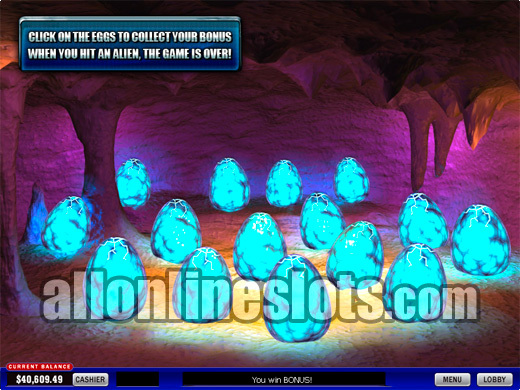 You can win free spins with the spaceship scatters and win instantly with the Alien Egg Bonus. 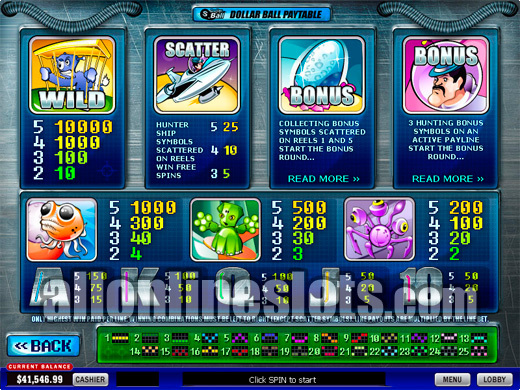 Alien Hunter is a video slot found at all Playtech powered online casinos. It uses the popular 5 reel, 25 line format and has three different bonus stages. 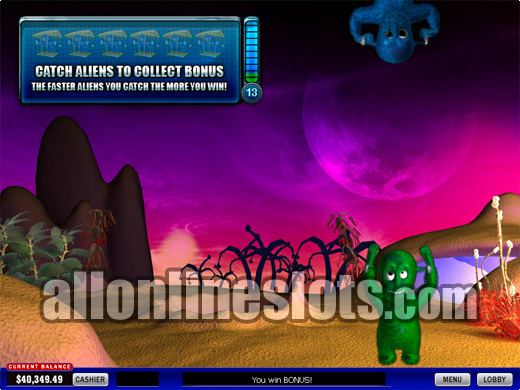 The game has an outer space alien theme and a top jackpot of 100,000 coins when played at the maximum bet of 10 coins per line. On the reels you have seven picture symbols and five card symbols (A, K, Q, J and 10). The picture symbols make up all of the highest pays and bonus wins and the card symbols make up all of the lowest wins. The alien in a cage is wild and substitutes for everything but the three bonus symbols. Lining up five Alien in a Cage wilds on any pay line wins the top jackpot of 10,000 coins multiplied by your line bet of up to 10. This pays 100,000 coins if you are betting max which depending on coin size gives you a win of between $1,000 and a huge $500,000. Other good reel pays include 1,000 coins for four wilds, 1,000 coins for five of the orange aliens and 500 coins for five of the green aliens. Overall there are a good amount of mid to low level pays to keep you going and the hit frequency is quite high. This is always a good thing as you will get more spins. The spaceship symbols are scattered and activate the free spin bonus. Get three, four or five anywhere on the reels and you win 5, 10 or 25 free spins. There is no multiplier for the free games so the jackpots do not grow. Still you are not paying for the spins so any wins are total profit. The Bonus Egg symbols appear on the first and last reels only. Get both on the screen at the same time and you win a shot at the Alien Egg Bonus. Here you get to see a whole lot of eggs in a cave (Screenshot). The bonus is a pick until pop style much like the one of the popular Jackpot Party game. Bonus wins are based on your triggering bet so the higher you bet on the reels the bigger the potential wins on the bonus. One of the eggs contains a X2 multiplier. If you pick this egg all subsequent wins are doubled. The bonus continues until you pick the egg containing the alien. The final bonus is the Alien Hunter Bonus. To win this one you need to line up three hunter symbols on any active pay line. You then have a choice of two options. A skill based bonus or a luck based bonus. Both offer pros and cons so it is up to you which one you choose to go for. (Screenshot). Once you have decided you move on to the bonus where aliens pop up and you have to click on them to reveal prizes. If you went for the luck option you get as long as you like to click aliens. If you went with the skill bonus you have a limited time to try to get the biggest prizes. The red aliens offer the biggest prizes while the green aliens are worth the least. If all this is not enough, Alien Hunter has one final twist. It is connected to the Dollar Ball jackpot link. For an extra dollar per spin you can have a shot at the progressive jackpot. The Dollar Ball bonus is a lottery style jackpot link that is found on several Playtech slot machines.